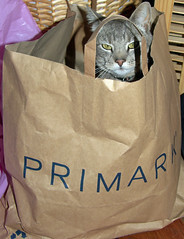 I was in Primark yesterday buying some pyjamas for Léon. I had noticed the last time I was in that Primark had switched from plastic to brown paper bags in an environmentally conscious move. Once the shop assistant had finished packing the pyjamas into my nice brow bag, he then filled it with other identical bags. Huh? He explained that all week in the pouring rain people had been complaining that they had got half way down Sauchiehall street before their envirobag had disintegrated leaving their new clothes in a soggy puddle at their feet, so were now trying to cover shoppers by giving them enough bags to get back to their car even on a rainy Saturday in Glasgow! So plastic may be out but each shopper is now using 3 times as many bags!